Let’s talk about hoes, shall we? I have a hoe collection. I’m not sure what my Dad would have thought of it or what my Mom thinks of it. How do you tell your friends, “my daughter has a hoe collection”? How did I end up with a hoe collection? Honestly, I don’t know. 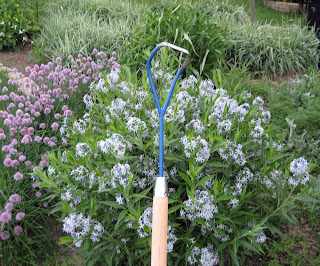 “Hoes just happened.” I bought my first hoe, then saw another one that looked like it might work better, so I got it. 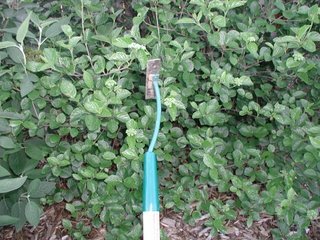 Then I’d see hoes for different uses in gardening catalogs, and I’d buy one, then another and then another. And sometimes I’d get my mom to get me a hoe for my birthday. What gardener wouldn’t want a hoe for her birthday? 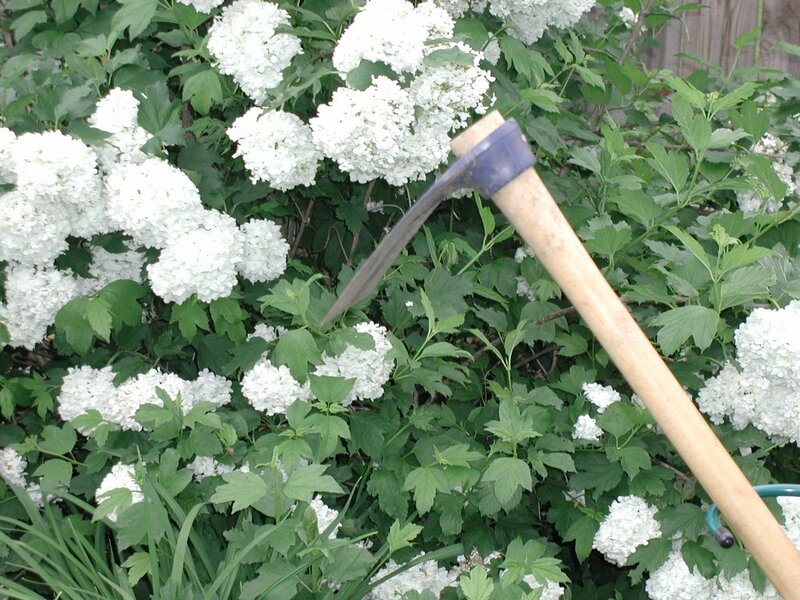 Later I branched out into hand hoes and antique hoes and then before I knew it, I had a lot of hoes. I had enough hoes to call it a collection. Does my entire family now about my hoe collection? Yes, they do. In fact, sometimes when I am visiting one of my siblings, they hide their hoes from me because they think I might take them for my collection. 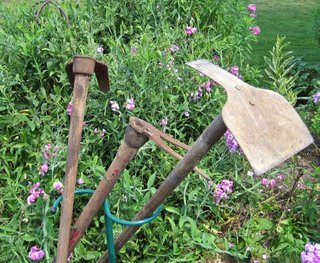 One of my brothers-in-law has his grandmother’s old hoe and it is a beauty. They just don’t make them like they used to. My niece hides it from me when I stop by even though I assure her I would never take it, I just want to look at it and try it out. One of my aunts even helped me get an old family hoe when another aunt and uncle were moving and found it in their tool shed. I keep that special hoe in my sunroom. And when my mom's neighbor moved away after 40 some years, he gave me his old hoe. Oh yes, it’s nice to know that when my family and friends are out and about and see old or unusual hoes, they think of me. They send me quotes and poems about hoes, too. Do my co-workers know about my hoe collection? Believe it or not, many of them do. In fact, to lighten the mood during some tense meetings several years ago, I actually showed a PowerPoint presentation of my top ten hoes, complete with commentary. Yes, it did lighten the mood, thanks for asking. And yes, if you’d like to pay my way to come and speak to your group about hoes, I’d be happy to consider it. I could bring my presentation and some actual hoes, too. Why did I take pictures of my hoes posed in the garden? Well, I needed pictures for that PowerPoint presentation. Or did the presentation come after I had the pictures? I’m not really sure, but I do know that I tried to be discreet so none of the neighbors would see me. After all, what would you think if your neighbor was dragging hoes out of her garage and posing them for pictures in her garden? Even without the picture taking, I wonder if my neighbors look in my garage when the door is up and wonder why I have so many hoes and garden tools in general hanging on the pegboard wall. Once I had the pictures of the hoes and a gardening blog, I decided to post my hoes for the whole world to see. I’m secretly proud of my hoes. Just google “hoe collection” and see what comes up. 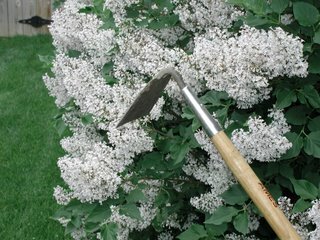 Yes, you get my hoe collection post! You get the idea. You can’t talk about hoes for very long without smiling. Try it sometime. I guarantee you just can’t take hoes all that seriously, even if you have the self-proclaimed World’s Largest Hoe Collection. Really, do you know of anyone with more hoes than me? You forgot to mention that you made a hoe calendar one year for friends and family featuring the hoe of the month! Maybe you should branch out and publish the calendar for others? Oh ... my .... GOD ! This is the most excellent "hoe" commentary I have ever come across .. and YES !!!!! the humour is outstanding .. I have been snorting and chuckling like an idiot .. good thing I'm not trying to drink coffee at the same time or the lap top would be covered in it ! Rock on with the humour girl ! I want a RoHo!!! That's the most awesome hoe diary ever! I once got a $50 hoe for my birthday. Oh, oh...can't catch my breath...laughing too hard at the friends and family hoe calender...who was Miss June?? Carol, if you ever get a shed built in your garden it could be nicknamed the Hoe Shack. Hoe envy is rising to the surface, must fight it back. The funniest thing is the niece hiding the prized hoe from you! HA! Are you an out of control hoeaholic? I have several of those same hoes, my collection is more general, all garden tools, especially older ones. But your RoHO surpasses them all! A PowerPoint hoe presentation? A hoe calendar? Carol, you take the cake--I mean, the hoe. carol - this totally cracked me up!! I'm at work eating my lunch while reading blogs and cracking up laughing. People are gonna think I'm nuts! I just want you to know that I never get tired of hearing about your hoes. ps i would totally buy a hoe calendar! What a well sorted collection. Have you catalogued them all? So on the calendar are there hoe holidays? Or commemorative dates celebrating each acquisition? I think the calendar is a wonderful family gift...it's always fun to see the collection! Okay, that was great. When are you trying out for stand-up comedy? That one would put you through the roof! 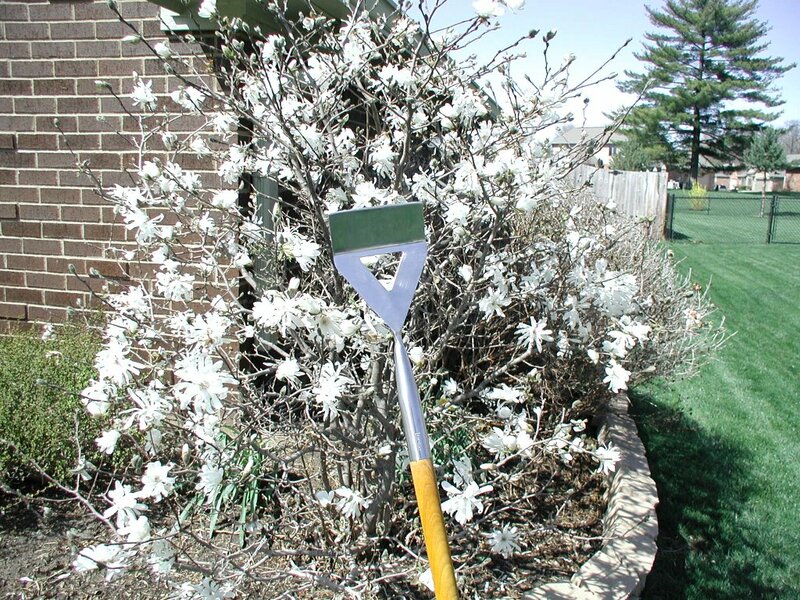 My earliest "noises I remember from childhood" memories are of my grandmothers hitting their hoes against the red Oklahoma soil attacking weeds. I like yours better. Pam said "Hoe Cake"... heh, heh. Here's a possible theme song on YouTube, Carol. Boil that cabbage down and turn that hoe cake 'round. You just crack me up Carol. 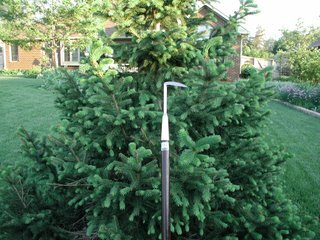 I must say that sometimes when I putt it looks like I used a putter hoe for the shot what with a sizable divot in evidence. Although this is funny I did learn something from your post. 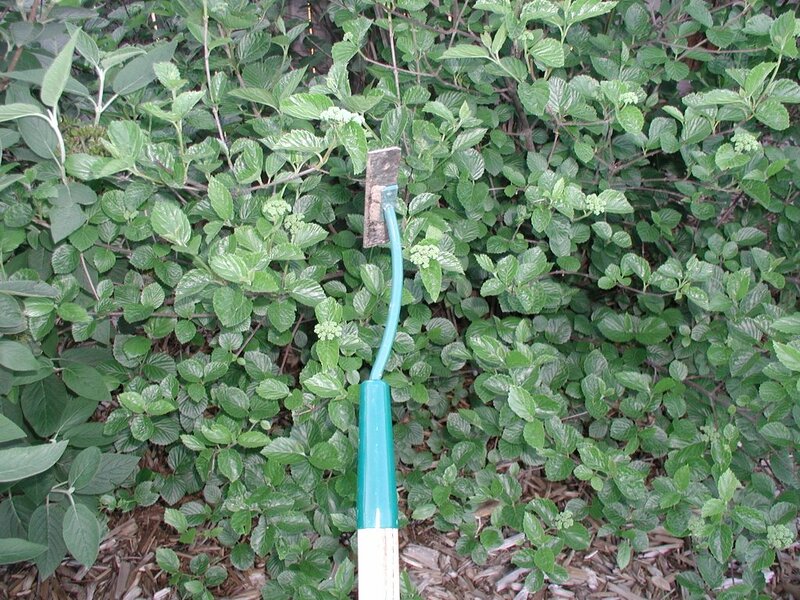 The type of hoe I use most often is a Collinear hoe. I didn't know that. 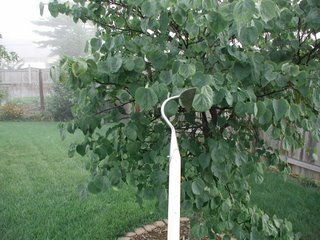 My Collinear hoe head is mounted on a light weight aluminum handle that has a release on it where, if I had other heads such as a cultivator head or a regular hoe head, I could change the head. I bet you don't have one of these. tee hee... Maybe you could ask for one for your birthday. It really is handy. It is made in Germany by Scotts. YOu know the quality is good being German made. Do you have a circle hoe? 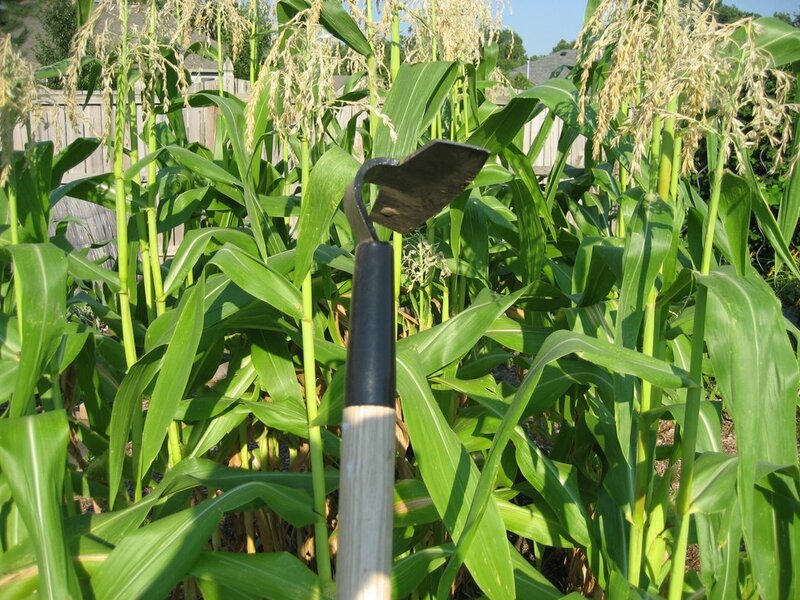 Really funny, who knew there were so many hoes! 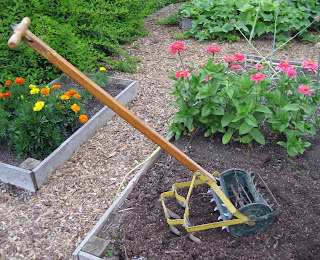 Seriously, though....I have never used a cultivator...I was afraid to say hoe...in the garden. Did anyone else count how many times Carol used the word hoe or hoes? It is my age. How old am I? What a day brightner! I am so glad I got to see the totally w(ho)lesome collection! Sherry at the Zoo, I did forget to mention the hoe calendar, thanks for reminding me. 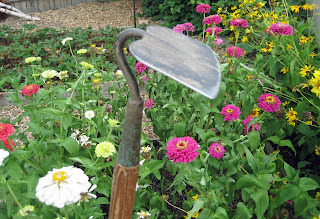 GardenJoy4Me, See, you can't talk about hoes without smiling! Robbinscabin, I've heard there are some RoHo's on eBay. 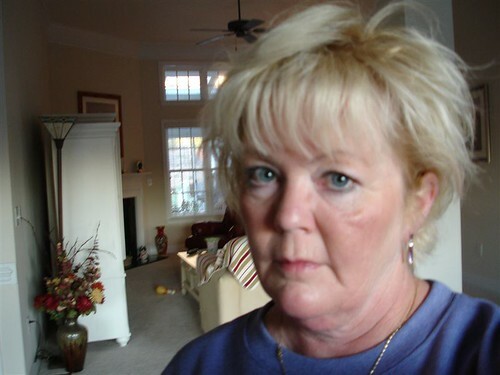 Aunt Debbi/Kurt's Mom, Say that out loud to someone who doesn't garden and see what kind of reaction you get. Annie in Austin, 'Miss June' was the gooseneck hoe. I like the idea of a hoe shack, but maybe I would call my shed a hoe house? Frances, Hoe envy? I love it! Pam/digging, Thanks, yes, there is a PowerPoint presentation of the hoes. Should I have admitted that? Gina, Maybe I will have some hoe calendars this fall to sell! Lintys, Happy to hear you had a good laugh on a day you needed it. Corinna, A hoe museum? Now there's a thought, I could charge admission and use the proceeds to buy more hoes. Leslie, Hoe holidays? I'm not sure there are specific hoe holidays but I've had some hoe birthdays and hoe Christmases. Brenda Kula, Thanks for the kind words. It is much better to have me go through the presentation in person than to just read about my hoes. Annie in Austin, You sure know your way around YouTube. I enjoyed that song and the Smothers Brothers. Lisa at Greenbow, I don't have a collinear hoe exactly like the one you described. Mine is from Lee Valley and does include another size blade. 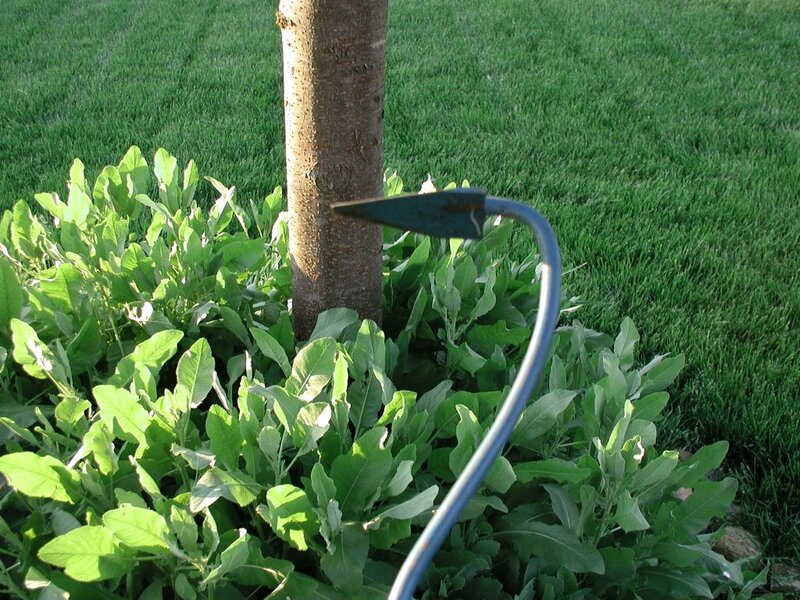 Many of my hoes are Dutch made. Kathy, No circle hoe, but someone from the circle hoe company I think left a comment once suggesting I should try it. Gail, Clearly I'm not afraid to say "hoe"! Aunt Susie, I did use that word a lot. I'll have to count how many times. Beckie, Thanks, I'm glad you enjoyed seeing the collection. Mel, Yes, my hoes enjoy the "limelight" and like being part of the only hoe collection I know of! Thanks all for your comments and for joining in the fun today. Isn't it funny what we collect. Great post. 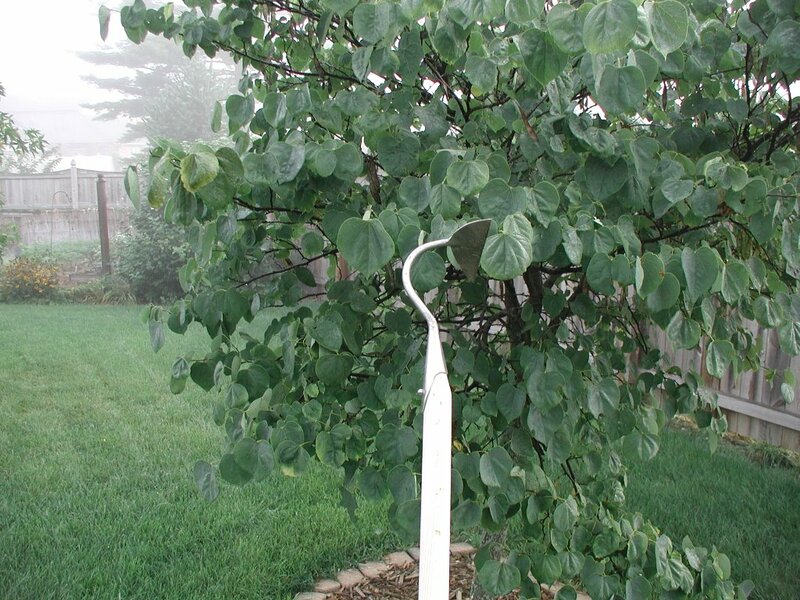 Wow, that gallery of hoe shots is just wonderful. I like all the angles and poses! Such a photogenic bunch to you have!! LOL. 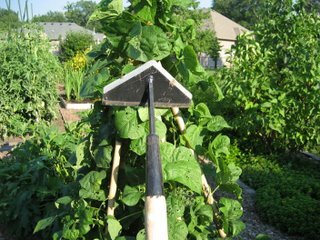 I have an "action hoe" that I bought to replace an old hoe that is sort of like your stirrup hoe. My old hoe was passed on to me 25 years ago by a gardner who was then in her 80's. It was squashed by some piece of heavy equipment while we were setting up for my daughter's garden wedding a few years ago. I kept it (of course) but replaced it as it was no longer so efficient and I thought it deserved a leisurely retirement. 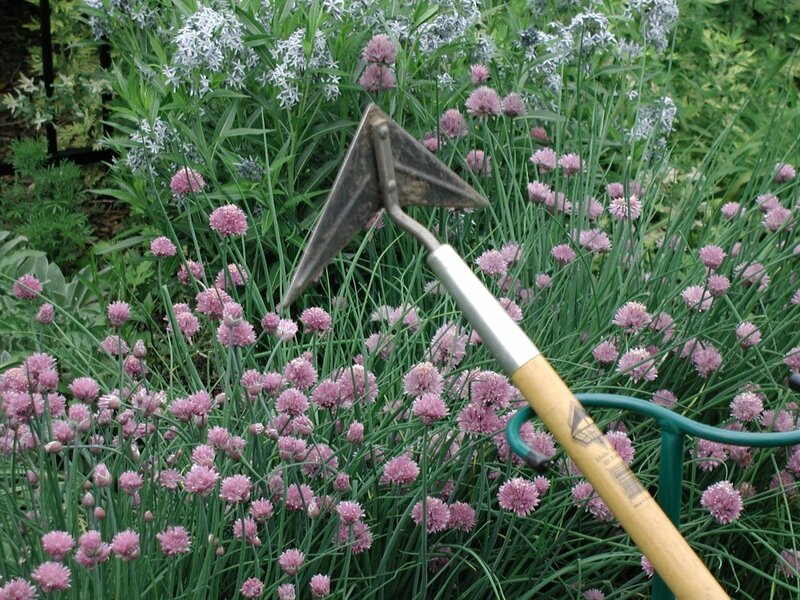 My new "action hoe" isn't quite as wonderful but I use it with great diligence. I think this Spring when I get "everybody" out of winter storage I will pose my hoes (all 3 of them?) for a little fashion show and link it back to yours! Hi, I'm Anna and I'm a recovering hoeaholic too. It is such a relief to come to a place where we can talk about hoes openly and get it all out. Clears my mind of weeds. I feel better knowing I'm not alone. I've now walked where other hoes have gone before me. I'm hopeful that hoeing will be more openly discussed and accepted since you've come out about it. Thank you. Do you remember that song "Ho ho ho, it's magic"? I can't remember anything else about it except that phrase. I think it's funny how collections get started. You have a great one here. I have a few antique hoes I found at yard sales. They do call out to you, don't they? 'I've never met a hoe I didn't like'! There's another for your list! 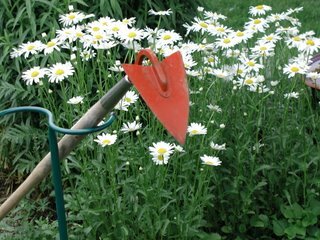 So here's a question for you, Carol (from someone whose lone hoe suffered a broken handle on our clay soil last summer): If you could pick only one hoe for use in your garden (I know, heaven forbid), which one would it be? 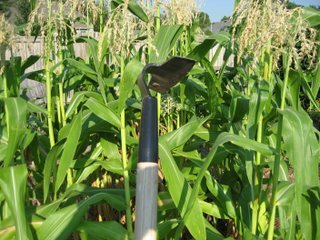 Which is your favorite hoe, and why? Oh My God. I'm here at work laughing so hard it turned into a coughing fit!!!!! I was going to ask, "So how many hoes do you have, Carol?" All of them are named very well accordingly to the type of hoeing they do. I would have loved to be with your coworkers to see your PowerPoint Hoe Presentation. Mad Man Bamboo, I think sometimes things find us and make us collectors of them. Cabs, I'd love to see a little fashion show of your hoes, linked back to mine. 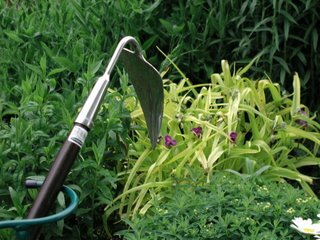 Other garden bloggers, how about it? Pose your hoes for some pics and let's have a garden bloggers hoe down! Anna, Anytime you need to talk about hoes, this is the place. It's safe for hoes here! LOL. Entangled, Yes, I remember that song. Are you sure it isn't Hoe, hoe, hoe, it's magic? Jane Marie, Oh yes. 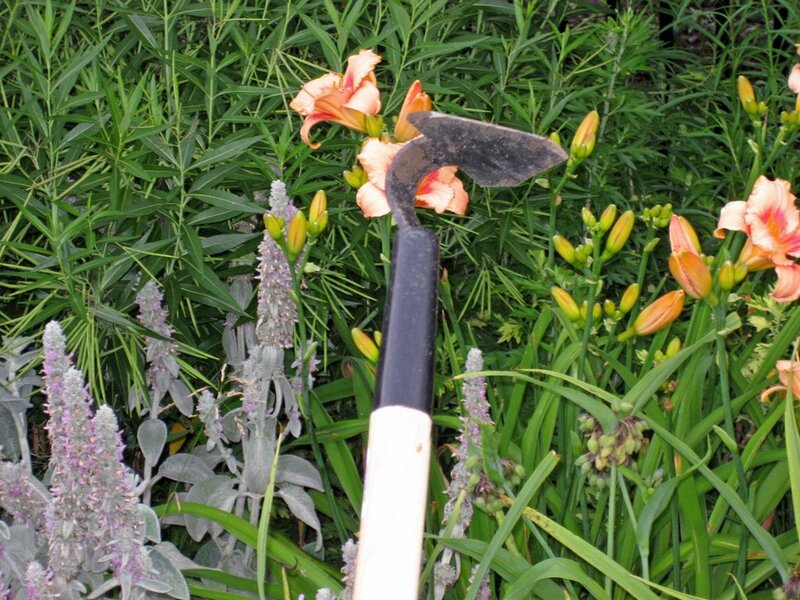 The hoes do call out to me and to other gardeners I'm sure. We just can't resist them! Layanee, That's a good one! Alison, Do I have to pick a favorite? I guess I'll try, but it depends on what I want to do with it in the garden. Mary, I don't have an official count of hoes, and I think there are one or two not pictured. 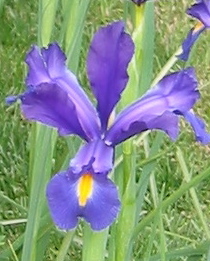 I'll count them this spring and take some new pictures, JUST for you. And yes, that Annie in Austin had a good suggestion for naming any shed I might get. Better than "Hoe House" that I thought of. That's a mighty collection of hoes! Why, you almost need a hoe house, just to store them! Heehee! Great article! Nancy J. Bond, I think I'll start calling my garage "the hoe house", since where the hoes all hang out. Melanie, Indeed, how did you miss it? You have to follow those embedded links sometimes! Not a cheap hoe in the bunch. You might even say those are some classy hoes.